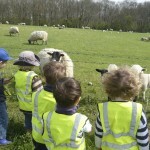 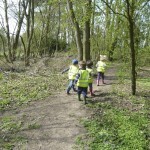 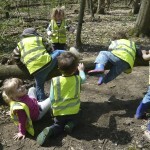 Walking along the nearby footpath to the local woodland provides wonderful experiences for children throughout the year. 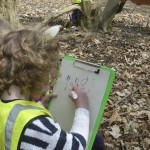 As well as discovering more about the natural world and seasons in a hands-on way, it also helps promote confidence, creativity, problem-solving, independence, encourages communication and raises self-esteem. 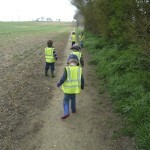 Along the route children have opportunities to see views of the local Castle, Steam Railway and the village roofscapes, including the church. 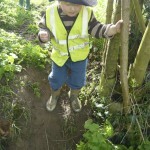 Children are learning by experience through outdoor play and discovery. 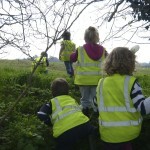 A trained first-aider always accompanies the children. 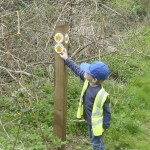 Adults always talk with children about the rules and boundaries when exploring out of the setting and why we wear high visibility jackets. 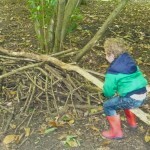 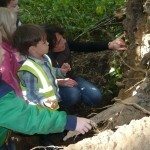 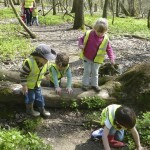 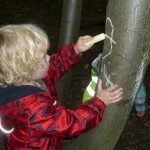 We always discuss with parents when we feel a child is ready to take part in woodland visits.